Bansko Resort: The town of Bansko is situated nearby the river Glazane (left feeder of Mesta River) in the north- eastern foot of Pirin, right bellow the highest and most beautiful part of the mountain. Its name comes from the old Bulgarian word "ban", which means "master". It is just 160 kilometers away from Sofia and 6 kilometers from Razlog. Bansko has developed into a favourite ski & snowboard destination, thanks to the excellent ski facilities combined with the unique architecture and history. 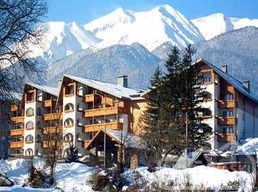 Bansko Ski Slopes: The ski pistes are located in two main ski - centres- CHALIN VALOG (1100-1600 m) and SHILIGARNIKA (1700-2500 m). They are approximately 10 km above the town on the northern slopes of Pirin, and are easily accessible for approximately 25 minutes ride on the new Gondola lift which starts from Bansko. The total length of the marked pistes is 70 kilometers. The lift and pistes operator in Bansko takes care for the maximum comfort of the skier and snowboarders with the exclusive 8-seats Gondola cabin lift by Dopplemayer, five high speed quads of the latest Doppelmayer models, one 3-seat lift by Poma, 7 drags and 10 baby drags. The total length of the lift equipment in the resort is 26 kilometers. All ski equipment can be used by one chip-card from SkiData. We also recommend a visit to the famous Rila Monastery and the busy city of Sofia. For trips of interest, please make reservation here.